More often than not the moment we get a smartphone, the first step is to download, Facebook, WhatsApp, Instagram, Snapchat etc. But hey! Its a smartphone and it is upto us how smart or dumb we make it. We unfortunately do not use our phones to their full potential. Despite some of the best android apps that we have, we tend to use our phones for Facebook and WhatsApp. 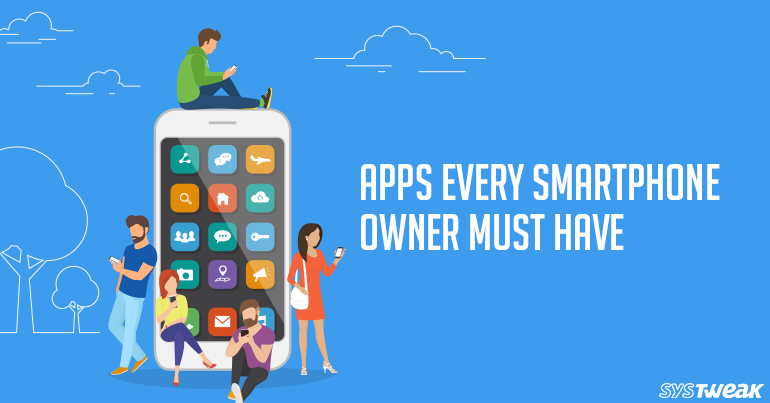 There are many apps available on the Play Store that can make your smartphone really smart by making your device productive, organized, and secure. That’s why this blog on the must have android apps on your phone in 2018. Before we even start, we don’t want to hoard your phone with too many apps which is why we have carefully shortlisted these 6 apps.These apps will resolve multiple woes! Why have we shortlisted these apps of the many available? So here are 6 best android apps that we think would make your phone usage more efficient and productive. Yes of course it’s the best app to take down notes, but guess what, you can also make sketches, add photos and videos as well. You can quickly scan your documents, business cards and any handwritten notes that you would want to refer to later. It also has a digital notepad which can capture all your creative thoughts! You can sync the app across any number of devices, which means you will always have to app by your side wherever you go. Worried about nosey people? Add a password to make it accessible only to you. You can create and share your thoughts and ideas with others in the circle who have this app. How about giving a quick feedback or tracking the work of all team members? Yes you can do that too!Which also makes its a good project management app for 2018. That’s some multi tasking app ! Talking of productivity, you can create agendas, memos, and even craft presentations! Create minutes of the meeting and share them hand to hand with your colleagues. For students, the app is a great option to clip and highlight the important parts of articles. These were just a few of the many features that the app offers. It has both free and paid versions. We’d suggest that you try out the free version first and then according to your needs jump into the paid version of the app. Photos! Music! Videos and Files! Yes we have so much data on our smartphones and why not? Haven’t our phones become the little treasure box that we carry with us everywhere? Coming to the point, most of struggle constantly with keeping our phones organized. The large memory that the phones now offer us have spoilt us to the extent that we keep adding different file formats until one day we realise how disorganized our phone has become courtesy all the multiple files that we have. Many of our pictures have multiple copies, we would have the same audio saved twice or three copies of the same ebook. Alas! Who has the time to sift through all of them and delete them. Here comes, Duplicate Files Fixer, an amazing app that finds and deletes all types of duplicate files on your phone. It will scan all your files in a matter of seconds. Either you decide the type of files you want to scan or run a full scan on your phone’. Choose a specific category and it will scan it for you. It can sift through for duplicates for any type of file. Worried you might delete the wrong files? The app will show you a preview before deleting the files. The app gives you the choice of UI design that you want. Simple for those who don’t like the frills and material theme for those who are looking for some cool animations and categorized results. For convenience of all, the app supports 14 major languages across the globe including Spanish, German, French, Spanish and italian. Yes your phone offers you a lot of space but it’s always better to utilize that space for storing other files. Your app takes on the responsibility to keep your phone clutterfree and creates space … all you need to do is tap a button! Struggling to keep a track of your finances? Forget to pay your bills on time? Worst still, left with no money by the end of month? Look into this Google Play Store Editors choice free budget app. A budget app helps you track your finances. So if you are planning for that big christmas vacation that you want to save money for, download one right away! Mint puts at one place all your financial details, be it expenditures, savings, investments, credit card details etc. Your personal financial organizer is all for free. One of the best android apps, it brings to you all your finance related details under one roof. So, instead of struggling to keep a track of all the expenditures, bills and investments, you have them all at one place. You will never miss a bill payment date again! Your app will remind you well within time of the bills you need to pay and the ones that are left to pay. Get saving tips from time to time. We actually found that helpful and motivating because the moment you tend to slacken, a simple tip gets you back on track. The app will help you create budgets that are easy to follow and will also help you save. Mint will tell you on how your credit score is calculated and the tips to maintain a good credit score all for free and the good part is you don’t even have to enter your credit card details. The most important factor, which we know you are also thinking about! The app is SECURE! Yes! The mastermind behind the app are the people from Turbotax. If you wish you can download the app on your desktop and if you trust the app you can sync your bank accounts, credit cards and spends on multiple personal devices. Last few years have seen a lot of hullabaloo around cloud services and why you need them. So for those who haven’t decided yet to pace up with why you need cloud services and what to look for in good cloud services, let’s look at these two aspects briefly. For those of you who know, can directly skip onto the features. Cloud Services- What and Why? Over the years as we discussed, the amount of data on our phones has increased. Be it photos, videos, audios, movies, or text files there is a lot on phone. What if you forget to carry your phone and need to access some data on it? Worse still what if you lose your phone? Will you be able to bear the loss of all your memories and the curated music list? Which is why to take a back up is the smart move to make. With a good cloud backup service you can not only take a backup of all the data on your phone but also be able to access the data from anywhere and anytime. Such is the beauty of technology isn’t it? Now there is no need to carry the hard disks, pen drives etc. Features of a Good Cloud Service? Secure: This is the number one factor to be considered. Your cloud services should keep your data safe and secure. It should use encryption to save your data and safeguard against cyber attacks. Easy Set up: You should be able to use your cloud services easily rather than deal with something complicated. Reliable: The data that you back up on your cloud service should have no instances of cloud outages. The main purpose of your cloud services is to be able to access your data from anywhere and anytime across the globe. Easy on the Pocket: Your cloud services should be easy on your pocket and not cause a dent. Easy Recovery: You should be able to access and recover your data easily. Your cloud service should have multiple backups, so that even if you lose data. What Kind of Data Can You Store on Your Cloud Services? The app has three ways in which you can backup your files, Custom Restore, Smart Restore and Search File. Use Smart Restore to backup all files on your phone. Custom Restore allows you to recover as per your choice and the last, Search File lets you search for the specific file. You don’t have to manually take any backups. Download the app and it will automatically take back ups of all your files. Thus saving you considerable time and effort. The service encrypts all your data thereby ensuring full security of your data. For those who want to share, the app also gives the option to share all files with the loved ones. You can give access to files to the ones you trust. The app has a simple and easy to use interface. So now that your data is secure and you don’t have the fear of losing it or being misused by miscreants, let us look at how you can take care of the next most important thing in your phone after data, your PASSWORDS! A good password manager is the need of the hour. With most of our accounts online, be it bank, shopping, social media platforms, majority of the services require you to have a passwords. You may have noticed, good services always demand that you make a password which is a combination of alphabets, characters and numbers. Unfortunately, more often than not, in sheer laziness and because of the tendency to forget, we create simple passwords and often have the same password for multiple accounts. Sadly, that makes our all our accounts vulnerable to cyber attacks and misuse of accounts and the threat is only going to potentially increase in the coming times. Which is why it is important to create strong passwords. Why do you need a Password Manager? Password Manager as the name suggests, are used to safeguard all your passwords, to save you the trouble of remembering all your passwords and yet giving you easy and quick access to all your accounts any time you want. That’s not where the role ends of the password manager. A good password manager also helps its users to create strong passwords for their different accounts. While there are many options in password managers, our top pick so far is LastPass Password Manager. The app is available on most of the platforms. It creates a virtual secure vault wherein you can store all your passwords and personal information (Yes! So that next time you fill up a form you don’t have to type in all the details again!). You just need to create one strong password and rest LastPass will take care of it. Definitely the best android app in this category, Password Manager keeps all your passwords and information safe in its secure vault. Just create one strong password to access all the other passwords. Users can keep their save their search logins and notes safely in the vault. We love this one – You can safeguard all your important information,such as, credit card details, health insurance details in the vault. Take the help of this app to create super strong passwords which are tough to crack. Since it is a manager, it also takes on the responsibility to manage your passwords in custom folders. For example all shopping app and website passwords would be in one folder. The app has multi factor authentication which further ensures security of all passwords and information in the vault. User can share info from their vault with their loved ones (Our advice, please be discreet when sharing your login details with anyone). You can save all your info online as well as offline. Lastly, they have no access to any of your info and all your details are encrypted, bank level, AES 256- bit encryption. You can create notes with photos attached and secure them in the vault. The app allows users to create voice memos and save them in the vault. Unsure if you will be able to create a strong password? Don’t worry the app allows you to have Finger Scan Lock. Now, just scan your finger to access your passwords. Emergency Access: Give emergency access to loved ones. You can create settings in which you can have a waiting period in which you can decline the access. Phew! That’s a power packed app with a very simple and easy to use interface! Before we move onto the next must have app, we insist that you do not share your passwords with anyone. Be discreet and cautious of who you trust. Nothing is more important than health and wellbeing, which is why our next choice in the must have android apps for 2018 is Google Fit. It is by far the best fitness app in 2018. Most of us may have resolved to focus on fitness this year, however we often get overwhelmed by the number of options to follow to stick to our resolution. This why we love Google Fit. It is a free app, with a no nonsense interface and it is mighty easy to use. Why We Love Google Fit? Google Fit gives us features which many other apps boast about with an essence of simplicity yet sticking to facts. Going through a plethora of apps, we realised that this app is crisp and has a clean interface. All you need to do is, log in, fill in your basic information and yay! You are good to go! The best part? You don’t need an extra device to sync with it. It will make use of the pedometer API to measure your steps. Simple doesn’t mean it is missing out on features? Well you can also add activities like zumba, yoga, swimming and cycling as well. You can track your entire days activity from the moment you wake up till you sleep. You will find all the activity details recorded on the app. Keep a real time check on all all your stats. The stat information includes, speed, pace, route, elevation and much more. Have a fitness device? Awesome! Link it with your device to track other measurables like nutrition, sleep and weight. Last not the least sync your details across different devices such as, phone, tablet, web and your Android smartwatch. So here we are at the end of the blog. We hope you find this list of must have android apps handy and are able to utilise them for the best. Of course the list of the best android apps of 2018 will keep improving because we are only in january and have 11 more months to go, but for now you could definitely rely on these 6 apps to make your phone smarter. Do subscribe to our blogs to get the latest tech news, hacks and much more straight in your inbox!